Yes, he looks really Metrosexual….but I do like it in a non-gay way. From Square Enix! Three of your favorite DC Comics’ heroes are redesigned by the artists of Square Enix for the DC Universe Variant Play Arts ~KAI~ Figures. These figures sport new anime-inspired costumes and designs that capture the essence of the familiar characters while giving them a unique style. The first series of these detailed and highly articulated figures include Batman (10 3/4″ H), Wonder Woman (10 5/8″ H), and Green Lantern (10 3/4″ H). Simon Baz is a new Green Lantern for the New 52, replacing the presumed-dead Hal Jordan. Chosen for his incredible triumph over fear and adversity, Baz is a truly impressive character and one of the best additions to the DC Universe since the reboot. This awesome figure stands about 6 inches tall and features brilliant detailing. He’s in-stock and ready to go so grab him now! The latest Green Lantern, Simon Baz, joins his New 52 compatriots in the DC Direct figure collection. And he looks awesome doing it. Shipping in May of this year, Green Lantern Simon Baz replaced Hal Jordan when the latter was presumed dead, and today continues to fight injustice across the galaxy. He was a surprising addition to the canon, but he’s quickly become one of its shining stars. We love him. He’s about 6 inches tall and comes with the red lantern, as you might expect. His look is based on his appearance in Crisis on Infinite Earths, but Atrocitus is one characters whose viciousness and withering glare carry through his every redesign. Grab him now! 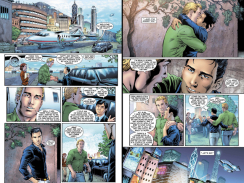 Green Lantern, one of DC Comics’ oldest and enduring heroes, is coming out as gay. The change is revealed in the pages of the second issue of “Earth 2,” out next week, and comes on the heels of what has been an expansive year for gay and lesbian characters in the pages of comic books from Archie to Marvel and others. But given “Earth 2” features retooled and rebooted characters, Scott is not old enough to have a grown son. It’s also another example of gay and lesbian characters taking more prominent roles in the medium. In May, Marvel Entertainment said super speedster Northstar will marry his longtime boyfriend in the pages of “Astonishing X-Men.” DC comics has other gay characters, too, including Kate Kane, the current Batwoman. The Exclusive KYLE RAYNER GREEN LANTERN Retro-Action Doll Figure is more than just a mouthful–he’s a fantastic addition to the nostalgic line of toys. The plush stands about 8 inches tall and features a plastic mask and a nice little bonus in the form of a lantern battery–after all, you wouldn’t want him to be without a power source, right? You never know! It comes in vintage-style packaging that makes it ideal for display!